The Genetti Family Tree is an ever-expanding project with its roots beginning in 1461. The tree includes hundreds of family members, several branches and approximately 18 generations. Yes, the Genetti clan has been quite prolific throughout the ages! A modern interpretation of the original Genetti Family Tree. Please be patient if you are unable to locate your branch on the family tree. As research continues, new names, dates, photos, notes and sources will be added daily. Plus every effort is being made to include female ancestors left out of previous ancestral trees. Where available, you will also find side branches containing the ancestral information of spouses. This will provide a deeper genealogical background of other surnames from the Val di Non region of Tyrol and offer a more complete picture of your ancestry. I suggest starting with the earliest ancestor on the tree: Pietro Genetti (b. 1461). Then begin clicking the linked word “tree” found on the lower left corner of each ancestor box to open the next generation on the tree. You can also start by locating your immediate family connection and work in reverse. Just have fun exploring and clicking! And remember to say hello to other family members by signing the Guest Book located at the top of the Family Tree page. Enjoy searching through the centuries and have fun learning about your Tyrolean ancestors. Special Note: I welcome any new information, photographs, corrections or additions you would like to contribute to The Genetti Family Tree. Also, please contact me directly if you have a different family tree containing a shared relative found on the main tree and would like to merge your information. Or if you have a completely separate Genetti tree with no shared relative and would like to include your tree on this site. I would be happy to help with all tasks. Click here to email information directly to me. Compiling this project is a daunting task, but with your help we can build a tree that represents the entire Genetti family. Special Note – 26 Sept 2014: The software for The Genetti Family Tree by Tribal Pages is not mobile-friendly. Unfortunately due to its complexity it can not be accessed by smart phone or computer tablet. The tree can only be viewed using a standard computer. If you see a white page when clicking on the link, it is because the page is not compatible with your tablet or phone. We apologize for this inconvenience. **Due to its size and complexity, the Genetti Family Tree is being hosted on a separate server created especially to accommodate extensive genealogical information with the ability to cross reference all listings. Disclaimer: Every effort has been made to verify source information and provide accurate ancestral documentation. However there may be mistakes or inconsistencies in some listings. Information on living relatives has been hidden for security reasons. I ask that you be respectful and discreet with all information contained on the tree. Due to the amount of time, energy and upkeep required to maintain The Genetti Family Tree, I ask that you do not copy or transfer any information, photographs or personal memorabilia to other genealogy databases, websites or trees (example: Ancestry.com, FamilySearch.org, etc.) without expressed permission from this site’s owner. Mille Grazie! 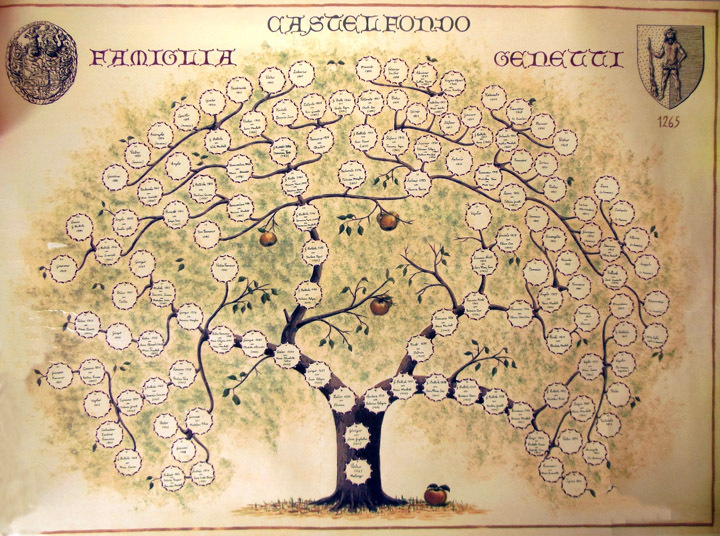 I have a pdf file of a lot of the family tree from our part of the genettis. Where can I send the PDF?